House Majority Leader Erin Herbig (left), D-Belfast, talks with Assistant Majority Leader Jared Golden, D-Lewiston, at the State House in Augusta, Dec. 7, 2016. Good morning from Augusta. Maine’s legislative races have been overshadowed by the hyper-competitive elections for the 2nd Congressional District and an open governor’s seat, but they could bring some of closest contests of the cycle with narrow divisions in the chambers now. We told you last week that Democrats were outspending Republicans by historic margins in the 2018 legislative races, but it’s hard to tell exactly what that means with the Republicans controlling the Senate by just one seat and Democrats holding a three-seat edge in the House. In October, Governing rated legislative chambers across the country and gave toss-up and lean Democratic ratings to the Maine Senate and House, respectively. That’s about where we would land today, but it’s based on a 40,000-foot look that doesn’t capture the nuance in these races. The seats that could decide control of the chambers fall into three main categories. Let’s take a quick Election Day eve look at examples of those districts, though there are always outliers. Lots of the most hotly contested seats in 2018 are perennially competitive, closely divided by party or both. Regardless of the election year, the Maine Legislature has lots of swing seats that draw high levels of interest from both parties but can also stay in a good candidate’s hands for a while even if the district’s party affiliation is narrow or runs slightly against them. 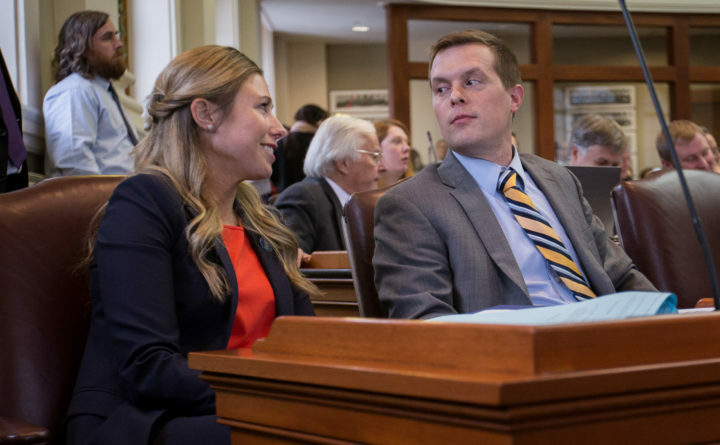 — Senate District 20: The open-seat race between Assistant House Minority Leader Ellie Espling, R-New Gloucester, and physician Ned Claxton, a Democrat from Auburn, is the most expensive race in the Legislature this year, seeing $442,000 in campaign and outside spending. Democrats are responsible for most of it in a unique district where they have a narrow edge by registration, but where outgoing Sen. Eric Brakey, R-Auburn, won easily in 2016. — Senate District 11: Senate President Mike Thibodeau, R-Winterport, won close races in 2014 and 2016 and Democrats are all in on replacing him with House Majority Leader Erin Herbig, D-Belfast. Republicans have a good candidate in former Rep. Jayne Crosby Giles of Belfast, but Herbig will make it tough for them to hold the seat this year. — Senate District 16: Democrats have run hard twice against Sen. Scott Cyrway, R-Benton, in a Waterville-area district leaning their way by 10 percentage points, but the retired deputy sheriff is well-liked in the rural parts of the district and won by eight points in 2016. Democrats have dumped in $182,000 to boost former Rep. Karen Kusiak, D-Fairfield, in her challenge, but the incumbent probably has an edge here. — House District 128: Former Rep. Archie Verow, D-Brewer, won by 96 votes in 2014 and lost to Republican Garrel Craig by 55 votes in 2016. Now, the two are running against each other again in a district that leans Republican by six points, but has been a point of emphasis for Democratic organizers in 2018. Expect another tight one here. Democrats are targeting lots of seats in the southern Maine suburbs. One of the keys to Republican success in legislative races during the era of Gov. Paul LePage has been targeted wins in Cumberland and York counties. But some of those Republican winners are term-limited in 2018 and Democrats want their seats, including in places where President Donald Trump is unpopular. — House District 9: This Kennebunk-area district has seemed like it should go blue for a while, with Democrats holding a nine-point advantage over Republicans there now and Trump losing it by nearly 20 points in 2016, yet Rep. Stedman Seavey, R-Kennebunkport, held onto it in close 2014 and 2016 races with Democrat Diane Denk of Kennebunk. She’s running against Seavey’s brother, Roger Seavey of Kennebunkport, this year. — Senate District 34: This southern Maine race between Rep. Bob Foley, R-Wells, and former Rep. Tom Wright, D-Berwick, could be a sleeper pick-up chance for Democrats. The district has been long held by Republicans, but it leans slightly their way by party registration and Trump lost it by a slight margin in 2016, according to data kept by Daily Kos, a liberal blog. — House District 5: This district — held by Rep. Beth O’Connor, R-Berwick — was a Trump-majority outpost in 2016. But she lost the seat in the Democratic year of 2012 before winning it back and holding it in somewhat narrow 2014 and 2016 elections. Democrat Charles Galemmo of North Berwick and independent Noah Cobb of Berwick are taking her on in 2018. Democrats are still making big-time defensive efforts in certain rural districts. Republicans have gained ground in much of rural Maine during the last six years. They’re forcing Democrats to play defense in some of these areas this year and these are ones where Democrats’ level of spending indicates that they’re worried. — Senate District 14: Democrats have dumped in $213,000 to defend Sen. Shenna Bellows of Manchester against Republican Matt Stone, who was an also-ran in a Biddeford-area Maine State race in 2016 before moving to West Gardiner. Bellows, a reliably liberal senator, wrested the seat from a long period of Republican control in a three-way 2016 race. Stone has gotten high marks from Republicans for his work in the race, though he suggested “rehab boot camps” for people addicted to opioids in an interview with a far-right radio show. — Senate District 2: This heavily Republican district, which Trump won with 61 percent, shouldn’t be represented by a Democrat, but former Attorney General Mike Carpenter of Houlton beat a flawed Republican opponent narrowly in 2016. Republican Karen Reynolds of Fort Fairfield is facing him now and this district is probably the best chance for a Republican pick-up in the Senate this year. — House District 55: Former House Majority Leader Seth Berry, D-Bowdoinham, was term-limited in 2014 and took back his seat from a Republican incumbent in 2016, when Trump also won a majority there. His re-election fight with Republican Guy Lebida of Bowdoin is now the most expensive House race with campaign and outside spending combined. The stumping will be over soon, then it will be time to count ballots. Polls across Maine will close at 8 p.m. Tuesday. Results from local precincts will begin to arrive soon thereafter. For those of you keeping score at home or assembling a poll warden fantasy team, Masardis has a solid record of being the first community to report results to the BDN’s crack vote tabulation team. Secretary of State Matt Dunlap is expecting 65 percent turnout, which is heavy. To see those results roll in, click here. Results for everything from the U.S. Senate race to local referendums will be displayed. Here is your soundtrack. For an overview of the voting process and what you will find on Tuesday’s ballot, click here. To test your knowledge of Maine election trivia — and maybe win something — click here. To read about how the candidates for Maine Senate stand on key issues, click here. For Maine House candidates’ responses to the same questions, click here. And to track all the money outside groups are spending to influence this year’s Maine elections, click here. — The candidates in Maine’s two hottest elections are making their final pitches to voters. Outside a paper mill, at hunters breakfasts and craft fairs, candidates for the Blaine House and in Maine’s 2nd Congressional District spent the weekend stumping for votes. Maine’s biggest races are high-stakes and deeply uncertain. Recent polls have seen Democrat Jared Golden and incumbent Republican U.S. Rep. Bruce Poliquin virtually tied in the 2nd District, where President Donald Trump won a historic split of Maine in the 2016 election. The gap in the race to replace Gov. Paul LePage between Democrat Janet Mills and Republican Shawn Moody has been hard to gauge, but is narrow by all indications. Those candidates — and independent Terry Hayes — made the rounds Friday, Saturday and Sunday in search of late-deciding voters who could swing the close and closely watched races. — A program in Rockland is helping men who overcame addiction behind bars stay sober. The Friend’s House, which opened in July, is run by the Midcoast Recovery Coalition and aims to help men who are struggling, or who have struggled, with substance use disorder have a safe and drug-free environment. It provides temporary housing and support to men just released from prison or who are in transition to the outside world. The program currently has the capacity to serve four men at a time, but its leaders hope to expand to 12 slots. — High winds blacked out more than 100,000 Mainers at one time or another during the weekend. Crews from Central Maine Power and Emera spent Saturday and Sunday restoring power throughout the state. Coastal and western mountain counties felt the brunt of the damage. Here is your soundtrack. As Americans attend to last-minute campaign duties on the eve of an election, people all over the English countryside are burning effigies of an unpopular political figure. It’s Guy Fawkes Day in Old Blighty. What better way to celebrate a failed domestic terrorist than with bonfires and pyrotechnics. In 1605, Fawkes — a Roman Catholic Yorkshireman inspired by that religion’s leaders on the European mainland — participated in a horribly botched attempt to blow up King James I and Parliament with barrels of gunpowder. Sir Thomas Knyvett, a minor but trustworthy royal official, discovered the gunpowder, foiling the plot. Fawkes was tortured, helping lead to the apprehension of other co-conspirators. Fawkes thwarted the executioner’s plans to hang, draw and quarter him by tumbling off the gallows, breaking his neck. But that did not stop the Brits from cutting up his corpse and distributing the pieces to “the four corners of the kingdom.” They had a strange penchant for disemboweling dissidents, including those who had already been buried, as was the case with Oliver Cromwell. When the Gunpowder Plot fizzled on Nov. 5, 1605, people throughout England supposedly lit bonfires to burn effigies of Fawkes and other Catholics and to rejoice over the king’s safety. They have been doing so ever since, adding fireworks — which could be interpreted as a touch of signature British irony or a spot of even more signature British “in your face” smugness.